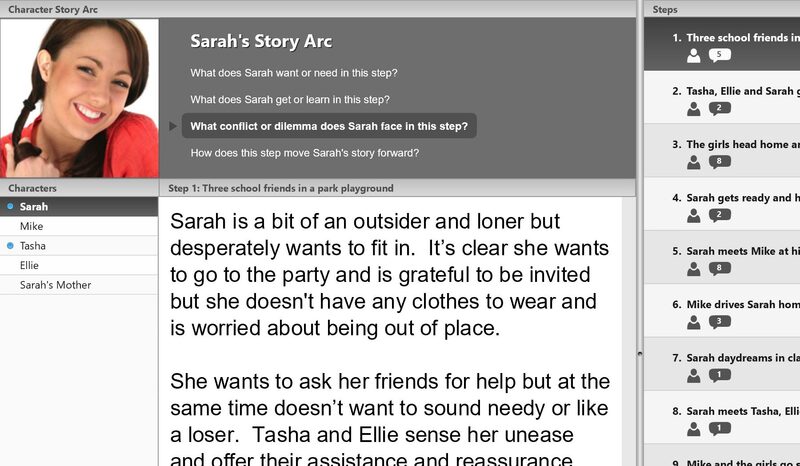 Create in-depth three-dimensional character profiles, analyze dialogue and develop their story arcs step by step. 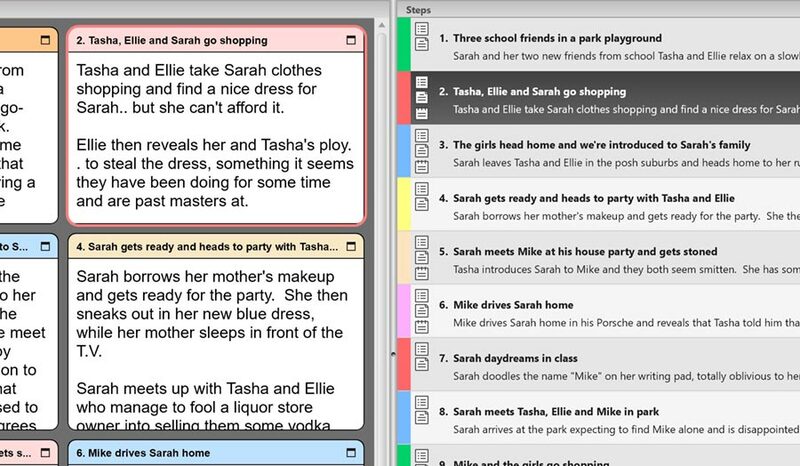 Script Studio was developed by a produced screenwriter and its intuitive and unique design helps you break your story down into sequences so you can build your script or novel step by step, chapter by chapter or scene by scene. Planning your story and rewrites in this way gives you an overview of your entire narrative while working on individual scenes. This "sequencing" methodology allows you to maintain your creative flow and encourages a structured approach to your writing. 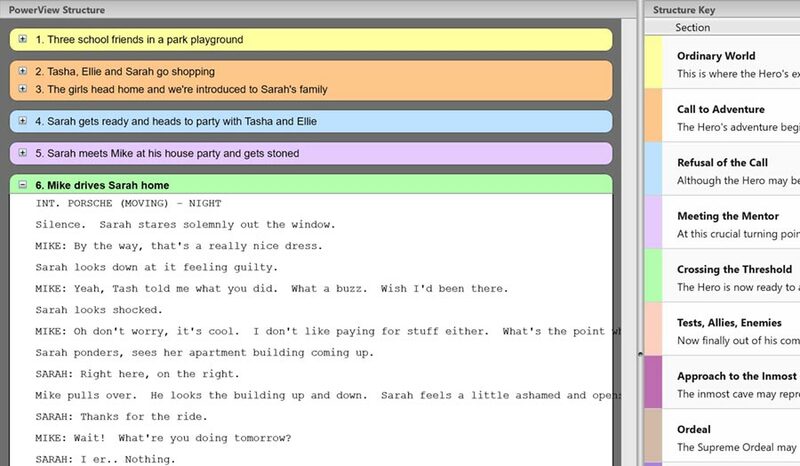 Script Studio has powerful structuring tools to color-code your narrative into acts or sequences, and includes templates which many Hollywood blockbusters are based upon such as "The Hero's Journey" and "3 Act Structure". You can customize these to suit your own writing methodology or create your own. Steps, chapters and scenes can be dragged around in your outline list or via virtual "Index Cards" and you can toggle which content to display and which to hide. Use Script Studio's powerful character development tools to create in-depth character profiles and unique characters. Choose a headshot from the extensive picture gallery to help you visualize who they are and answer a series of probing interview style questions to further understand your character's backstory and motivation. You can also define relationships, analyze dialogue and develop individual story arcs step by step as you build and hone your narrative. 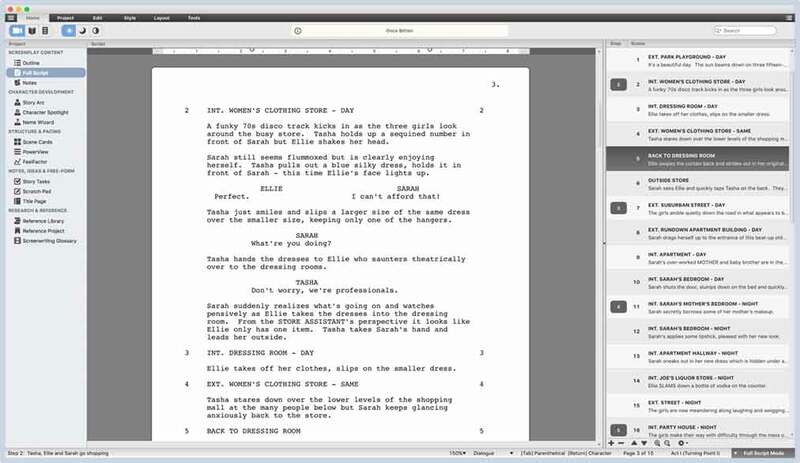 Script Studio automatically handles layout and pagination as you type and via "Tab and Enter" keyboard shortcuts and auto-complete which suggests character names, scene headings and transitions and allows you to focus on your story and characters without inhibiting your creative flow. The software also includes its own custom Courier font to ensure pagination matches across platforms and that your printed screenplay appears more legible to the professional reader. A FeelFactor™ is a story element that evokes an emotional or intellectual response in your audience such as gore, shock, tension, conflict, action, mystery and romance. 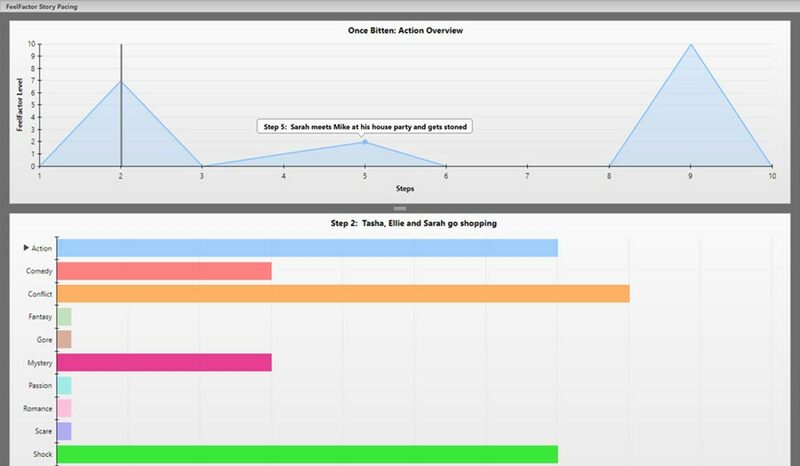 By setting the level of each FeelFactor for each step or chapter you can gauge the pacing of your narrative via a colorful interactive graph. You can also isolate and display individual FeelFactor graphs and simultaneously compare your own story pacing with movie reference outlines in the same genre. When your script, play or novel is complete Script Studio offers you a variety of ways to share it. You can export it in a variety of different formats such as PDF, Final Draft, Rich Text, Fountain and even in HTML for publishing to the web. 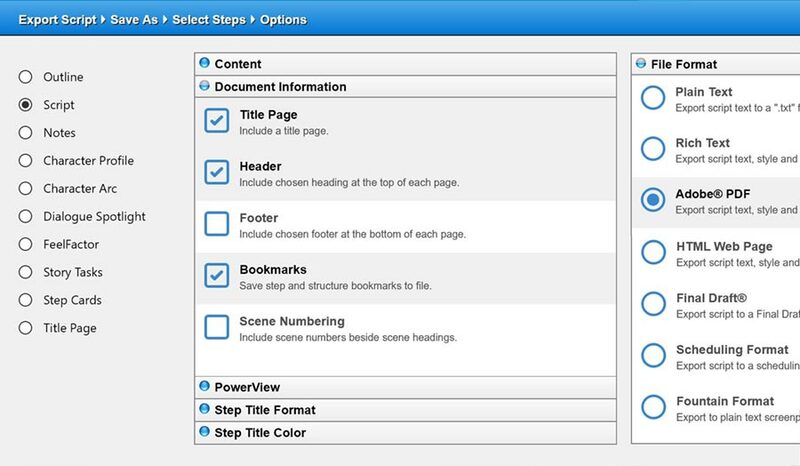 Its powerful print and export wizards allow you to select which steps and elements of your project you wish to include, and every aspect, such as title page, scene numbering and chapter heading styles, can be customized to suit your needs. "I just wanted you to know that I absolutely LOVE your program! I am already telling my friends about it. Thanks again for taking the time to build and offer this software." 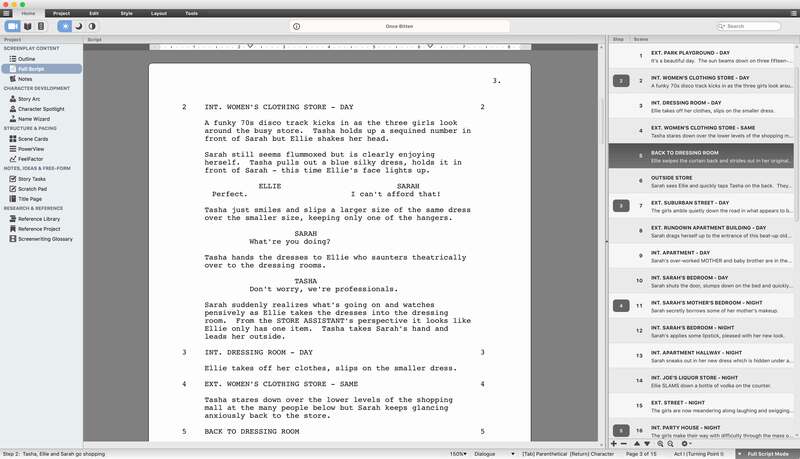 "I am a screenwriter and have tried a number of different programs. Yours is elegantly designed and incredibly helpful." "I bought your software because it helps tremendously in planning and constructing my stories. Please accept my compliments on a program that is very intuitive, easy to use, and really makes organizing and experimenting with story elements quite fun." "I'm a professional screenwriter and I think your program is brilliant. It's saved me a lot of time, the same way switching from a regular word processor to formatting software saved me countless hours."